Here at St Vincent’s Dental Centre, we are dedicated to introducing and using the newest technologies and are continually updating our equipment. Dental technology is constantly evolving and we want to make sure you benefit from the very best and most comfortable dental experience by using up-to-date techniques and procedures. How Can Technology Help Improve My Dental Visit? By using advanced technology, we can diagnose and understand your needs more accurately and are able to explain our findings to you using clear visual images. 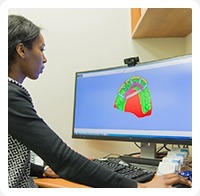 Our technology includes a cone beam CT scanner. This is an extremely useful piece of equipment that will provide a 3-D image of an area to be examined and is used for both diagnostic and planning purposes. We use digital photography and our intra-oral cameras for diagnostic purposes and to show you the inside of your mouth in much greater detail. These images can provide a wealth of information and make it much easier to understand any treatment that may be required. Microscopes are often used by our dentists during treatment to provide a much greater degree of accuracy. If you do require restorations such as crowns, veneers or inlays, these can often be created while you wait using our digital 3-D milling machine that uses the very latest CADCAM technology. It is very important to us that you receive the highest standard of dental treatment available today. Combining the most up-to-date technology with friendly dental care, helps us achieve this ideal. For more information about the technology we use at St Vincent’s Dental Centre, give us a call on (03) 9419 7022. You are welcome to visit us at 3/55 Victoria Parade, Fitzroy, Victoria 3065.